GOLETA, Calif. (AP) — The son of a Hollywood director stabbed three men to death in his apartment, gunned down two women outside a sorority and killed a sixth person in a rampage that was foreshadowed by a chilling Internet video in which he vowed to his victims that he would "take great pleasure in slaughtering all of you." Authorities said the 22-year-old lone gunman, Elliot Rodger — the son of a director who worked on the "The Hunger Games" — carried out his attacks Friday night in the beach community of Isla Vista near the University of California, Santa Barbara. The rampage happened hours after he looked into a video camera and warned in a disturbing Internet video that he would slaughter those with a good life — especially women who shunned him, authorities said. Deputies found three semi-automatic handguns with 400 unspent rounds in his black BMW. All were purchased legally. Authorities had had three contacts with Rodgers in the past year, including one case in which he claimed to be beaten but deputies suspected he was the aggressor. On April 30, officials went to his Isla Vista apartment again to check on him at the request of his family. But deputies reported back that the Santa Barbara community college student was shy, polite and having a difficult social life but did not need to be taken in for mental health reasons, Brown said. Attorney Alan Shifman said the Rodger family had called police after being alarmed by YouTube videos "regarding suicide and the killing of people" that Elliot Rodger had been posting. Brown called the tragedy "the work of a madman" and said the videotape posted by Rodger the night of the killings is a "particularly chilling one, in which he looks at the camera and talks about what he is about to do." In the YouTube video, Rodger sits in a car and looks at the camera, laughing often, and says he is going to take his revenge against humanity. He describes loneliness and frustration because "girls have never been attracted to me," and says, at age 22, he is still a virgin. The video, which is almost seven minutes long, appears scripted. "I'll take great pleasure in slaughtering all of you. You will finally see that I am, in truth, the superior one, the true alpha male," he says on the video. Earlier Saturday, Shifman issued a statement saying Peter Rodger believed his son, Elliot Rodger, was the shooter. It was unclear how the son would have obtained a gun. The family is staunchly against guns, he added. "The Rodger family offers their deepest compassion and sympathy to the families involved in this terrible tragedy. We are experiencing the most inconceivable pain, and our hearts go out to everybody involved," Shifman said. Richard Martinez said his son Christopher Ross Michael-Martinez, 20, was killed in the shooting. He blamed politicians and gun-rights proponents. "When will this insanity stop? ... Too many have died. We should say to ourselves 'not one more,'" he said. The shootings started around 9:30 p.m. in Isla Vista, a roughly half-square-mile community next to UC Santa Barbara's campus and picturesque beachside cliffs. Alexander Mattera, 23, said his friend Chris Johnson was walking out of an improv comedy show when he was shot in front of a popular pizza place. He stumbled into a nearby house. "He walked into these random guys' house bleeding," he said. Mattera was sitting at a bonfire with friends when at least one gunshot whizzed overhead. The friends ran for cover when they heard the barrage of gunfire. "We heard so many gunshots. It was unbelievable. I thought they were firecrackers," he said. Isla Vista, which is centered on university life with outdoor cafes, bike shops, burger joints, sororities and fraternities, was shrouded in fog and unusually quiet Saturday. 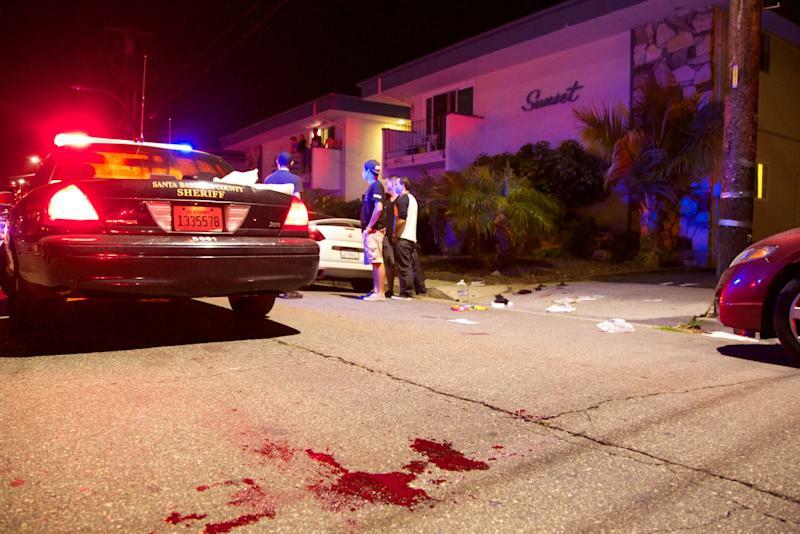 Police tape crisscrossed Isla Vista streets, while blood was still visible on the asphalt. Bullet holes pierced windows of a parked car and the IV Deli Mart. A small shrine of flowers was growing outside the business, whose floors inside were stained with blood. For much of the day, the wrecked BMW driven by the shooter remained on the street, its windshield smashed in and its driver's door wide open. UC Santa Barbara senior Kyley Scarlet said she heard the BMW smash to a halt outside a house she was in. Scarlet, who is a former sorority president, said two women from a sorority next door were killed on the lawn, where a pile of flowers grew on Saturday. Crying students wandered up to the spot, shook their heads and hugged each other. Scarlet said a third sorority member was wounded there as well. Scarlet said she was very disturbed by the video describing his anger at sorority girls. "It's hard thinking my actions, being part of a sorority, led him to do this," she said. "When I saw that video, I was shaking and crying." In a statement, the university said it was "shocked and saddened" that several students were shot. "This is almost the kind of event that's impossible to prevent and almost impossible to predict," UC President Janet Napolitano told reporters after giving the commencement speech at Laney College in Oakland, California. California Gov. Jerry Brown offered his condolences to the victims' families, saying he was saddened to learn "of this senseless tragedy." The Rodger family is not ready to speak publicly yet, but wants to cooperate fully with police, Shifman said. "My client's mission in life will be to try to prevent any such tragedies from ever happening again," he said. "This country, this world, needs to address mental illness and the ramifications from not recognizing these illnesses."